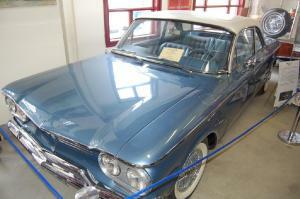 Super Monza - Corvair Museum: The Super Monza was a one-off GM Styling experiment. Until 1999, the Corvair Museum was located in Richmond, Virginia. From 1999 until 2002, the museum was closed. As of August 25, 2002, the Corvair Museum is now officially located in the Ypsilanti Automotive Heritage Collection (YAHC) of Ypsilanti, Michigan! The Corvair Museum is operated and maintained by the volunteers from the Corvair Preservation Foundation. The Ypsilanti Automotive Heritage Collection, as its name implies, features automobiles and related items with ties to Ypsilanti. It has many first-rate exhibits and the feel of the place is very authentic--not antiseptic or dark like so many museums. Instead, there is a genuine nostalgic feel and there is a lot of natural light, especially in the gallery containing Corvair materials.